Detail of equipment from noise orchestra performance at an Electron Club open day, 2008. Bring along things that make interesting sounds which deserve to be given an audience. 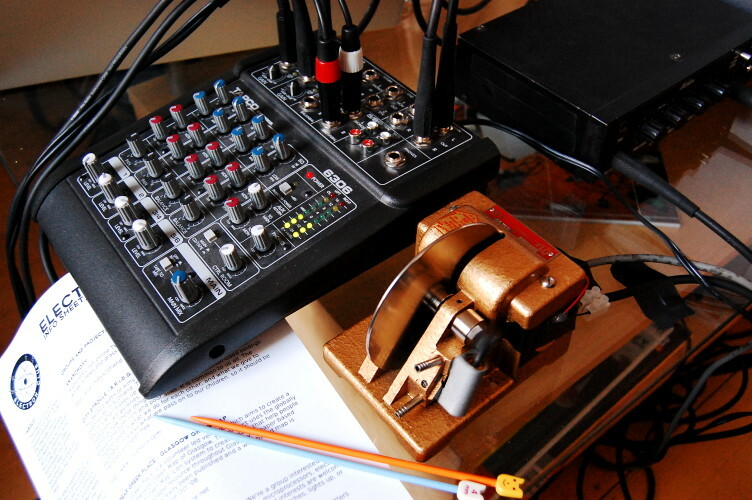 Those with a wider interest in noise and noise machines are also invited to come along, along with anyone who would just like to find out more about Bridge Rectifier and hackerspaces. at Unit 1B, Hebble End Works (by canal, behind the cycle cafe), HX7 6HJ. Join us for the inaugural performance of the Bridge Rectifier Noise Orchestra, a few drinks, some delicious thai food and an opportunity to find out more about Bridge Rectifier and hackerspaces — and how you can get your geek on. Have noise? BRing it along! There is no charge to attend, but donations are welcome and will go towards the running costs for the space. at Midgehole Working Mens Club (The Blue Pig), Midgehole Road, HX7 7AL.